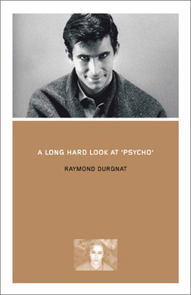 The dossier of tributes to Raymond Durgnat in Issue 20 of Senses of Cinema looked ahead to the posthumous publication of A Long Hard Look at ‘Psycho’, and whetted the appetite by printing the opening section of close analysis. The book itself is a pleasure to handle and to read. Rob White of BFI Publishing deserves our gratitude for persuading Durgnat back into writing books after a long gap, first with the study of WR: Mysteries of the Organism (BFI, 1999) in the Modern Classics series, and then with the Psycho book, which outgrew the format of the companion series of older Classics: it’s twice the length and nearly twice the page-size. Rob also helped to round up contributors to the tribute, me included, and himself contributed a rare editorial-page obituary to Sight and Sound, ending with the claim that Durgnat “may come to be seen as the greatest critic the cinema has produced” (July 20 2002). I assume that the words on the back cover of the book are his too. “An unmissable contribution to the study of Hitchcock, Hollywood theory and movie-makers’ own ideas about film” – fair enough. But the claim that it “will change the way we analyse cinema” is more debatable. In a sympathetic obituary in The Guardian (24th May 2002), Kevin Gough-Yates commented that “Ray was no scholar”. A better way of putting it is that he was not an orthodox scholar. He was widely read in many intellectual fields, including aesthetic theory and psychoanalysis, and brought his knowledge to bear on cinema in fertile and suggestive ways, not least in this final book, but one sees what Gough-Yates means. Durgnat’s impatience with academic conformism led him to cut corners provocatively, and this inevitably diminished his influence as film studies grew ever more institutionalised, and more conventional in its scholarly methods. Nor, for better or worse, is the final book free of such corner-cutting. Listing, in the bibliography, his own 1974 book The Strange Case of Alfred Hitchcock (London: Faber and Faber), Durgnat acknowledges “some embarrassing errors of detail”. These were not surprising, given the number of films he was writing about at such length, without at that period being able to check videotape copies or to access much in the way of reference material. That excuse has now gone, but the errors have not. The credit titles, and the film’s opening, are given a brilliant in-depth analysis, supported by frame-stills, including the superimposed time of 2.43 p.m., but there is no image of the superimposed date, which enables Durgnat to get it wrong: he says Friday December 12th, but on screen it’s Friday the 11th. The error is tiny, and almost reassuring, like a Hitchcock cameo appearance, telling us at the start that this is the same Durgnat we know and love from way back. But while Hitchcock only appeared once per film, the errors here proliferate. He puts Jean Seberg into the wrong Godard film, mis-dates some other non-Hitchcock films by several years, and gets a key line and a key family relationship wrong in Sabotage, the 1936 Gaumont-British film that he rates very highly. Nor was Hitchcock’s wife Alma Reville ever “his boss at Gaumont-British”: he means Gainsborough, a decade earlier, and even there the word ‘boss’ considerably overstates it. A list like this, which could easily be expanded, will seem pedantic, but the casualness sits oddly with the scholarly format of the book. It’s as if a casual dresser is being squeezed protestingly into a starched shirt and morning suit; ink-stains appear and buttons pop off. Gough-Yates wrote of Durgnat that “his work may be said to be distinguished by its absence of references and footnotes”, but references and notes are an integral part of the BFI format. As in all the Classics, full film credits are given at the end, compiled by the excellent Markku Salmi of the BFI Filmographic Unit. So far so good. But the endnotes are a problem: mostly, they offer substantial observations that relate closely to the main commentary, and would go better as footnotes or as part of the text – turning back and forth is an irritation. Actual references are thin, and never supply page numbers in normal BFI style. Durgnat evidently did no primary research on the production process, e.g. in the Hitchcock collection at the Margaret Herrick Library in Los Angeles, getting his data instead from Stephen Rebello’s book, Alfred Hitchcock and the Making of ‘Psycho’ (New York: Harper, 1991), which again is fair enough; but the lack of precise cross-reference to Rebello, or to anyone else, is often confusing. Why, for instance, does he say on p.14 that “Psycho mostly uses a 28mm lens or thereabouts”, when Rebello makes a point of recording that “The director insisted on cameraman John Russell’s shooting virtually the entire movie with 50-millimeter lenses” (p. 93 of my 1992 Mandarin paperback edition)? Is Durgnat mis-remembering Rebello, or disagreeing with him, and if so on what grounds? And he is surely wrong to suggest, again contra Rebello, that Russell was an old cinema collaborator of Hitchcock’s, rather than a fast-working member of his regular TV crew – wasn’t that the whole point of using him? One gets the feeling that, out of understandable respect for their author, the publishers excused him from the normal degree of care and control, and of copy-editing. And the stills, though excellent in quantity and quality, could have been better co-ordinated with the text. They are given in blocks every few pages, so that a detailed visual analysis of a particular composition may relate to a still that is several pages away (in which case we have to find it for ourselves, since the book eschews even internal page-referencing) or, sometimes, is not in the book at all. I emphasise these frustrations because they get in the way of our engagement with the flow of analysis and commentary. Durgnat is convincing in his emphasis, from the very first paragraph onwards, on the crucial process of interaction between author, text and viewer in Psycho, founded on minutely precise and knowing calculation; the reader of this book is less expertly ‘directed’. Nonetheless, in experienced opinion, the shower scene was Hitchcock’s directorial creation; and after all it was he, not the ‘illustrative sketches’, who controlled the timing and the rhythm, the dramatic modulations, the quality of light and all the other ‘indefinables’ that transform a ‘grammar’ into a ‘poetic’. The two Psychos have near identical structure, narrative, dialogue and ‘attractions’, yet the world of difference between them demonstrates the power of fine details whose forms and meanings are so hard to describe in words that we’re always tempted to think of them as ‘mere style’, or ‘superficial detail’. They may be hard to describe in words, but Durgnat, in the space between these two pages, has managed it superbly. My reading of A Long Hard Look at ‘Psycho’ coincided with the TV premiere in England of a programme looking back on the life of the comedian Peter Cook (1937-1995), entitled At a Slight Angle to the Universe. He was at the same Cambridge college as Durgnat, and, like him, was prolific and successful in the ’60s and ’70s, but less productive thereafter; laments that he had not fulfilled his early promise were countered by the argument that he had abundantly fulfilled that promise early on. Durgnat, I think, is comparable. The books of his prime decades will, likewise, last, given a special status and value by their quality of standing at a slight angle to what one might term mainstream film studies. And he made more of a comeback at the end than Cook did. The Psycho book deserves to sell out, and then to go into a new edition, with an ironing out of the errors, and a reordering of the illustrations and notes and references. And, please, an index. The distinctive angle will remain. Vertigo: The Best Film of All Time?